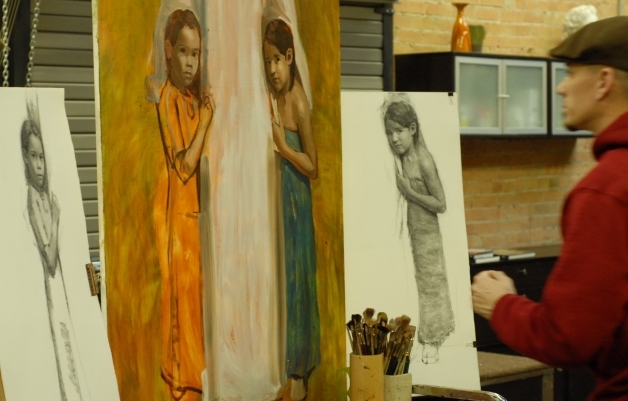 Jeff Hein was in his studio today and working on the base painting of the children in his multi-figure painting. 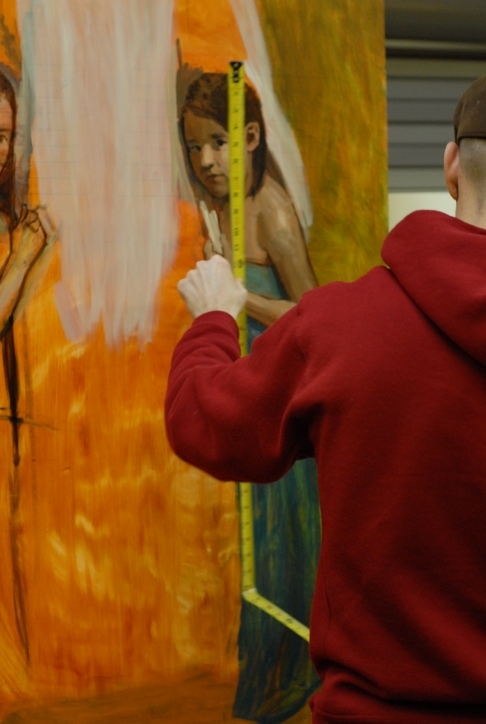 He really focused on the figure on the right side of the painting today. He was also roughly laying in some of the colors of the clothing. He would stop at times to stand back and see how things were developing, at times taking measurements to see if the proportions were correct still. He was not concerned with color too much, as he said it was almost like a black and white drawing for him at this level. I asked how many times he intended to paint on the faces of the children, and he said it all depended, as later on he would go back in when a model was present and paint on top of his base layer and lay in the colors he was wanting. I then asked about the face of the adult in his painting, and he said he painted him about 7 times. He also said that usually, but not always, the more resolved and more realistic he wants a face or body to be, the more times he will paint over it in layers. This entry was posted in Process and tagged art, art classes in Utah, base layer in painting, Drawing, drawing from life, Fine art, Hein Academy of Art, jeff hein, oil painting, painting, reference drawings, Salt Lake City, Utah Art. Bookmark the permalink. Demo clip of Joanne's painting session. Just wanted to express how much I’m enjoying these blog updates. Keep them coming. Makes me feel like I’m a silent observer inside Jeff’s studio. i am fascinated: who is writing this blog? and why is Jeff not actually contributing to it? Due to the unfortunate fact that there is not enough time in the day for everything that I want and need to do I have asked my assistant/student Sarah Hessinger to keep my websites up to date. I will still post occassionally but she will do most of the writing so that I can focus on painting, etc.